What the government gives one, it takes away from another -the affluent in this instance. To compensate for largesse to salaried earners at the lower end, a 10% surcharge is being imposed on tax on incomes between Rs. 50 lakh and Rs.1 crore. Someone with an annual taxable income of Rs. 60 lakh will pay about Rs.1.55 lakh more in tax. About 1.5 lakh people fall into this, now seemingly broader, category of affluent taxpayers. Income tax professionals said the new surcharge was necessary to offset revenue foregone by the Rs.12,500 rebate extended to all taxpayers. 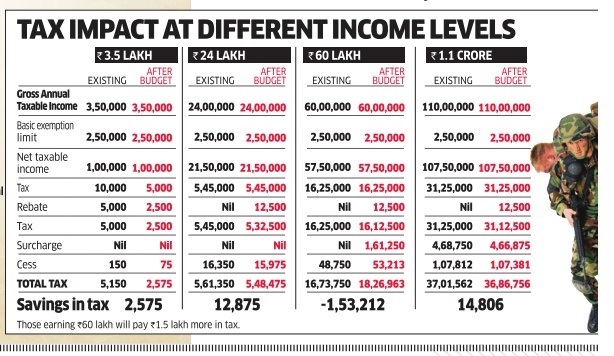 Left unchanged is the 15% surcharge on tax for annual incomes over Rs.1 crore. In fact, taxpayers in that bracket will actually save about Rs.14,000 due to the rebate (as the surcharge will be proportionately reduced). Finance minister Mr. Arun Jaitley stuck to the tenets of fiscal prudence, said Sonu Iyer of EY, having halved tax on incomes of Rs.2.5-5 lakh to 5%. The minister made the point in his Budget speech that only 24 lakh people show an annual income exceeding Rs.10 lakh, though more than 12.5 million cars were sold in the past five years and over 20 million Indians went abroad in 2015. “From all these figures, we can conclude that we are largely a tax noncompliant society. When too many people evade taxes, the burden of their share falls on those who are honest and compliant,“ he said. The surcharge for incomes above Rs.1 crore was first introduced as a one-time measure in 2013 by then FM P Chidambaram and was subsequently extended. It started at 10%, was raised to 12% in 2015 and to 15% a year later. The Budget 2017-18 is less kind to top taxpayers in other ways too. It caps the tax benefit on home loans if the property has been rented out, bringing it on a par with the benefit for self-occupied property under Section 24. “At an income of Rs.60-70 lakh, an additional tax of Rs.1.5 lakh will not make a big difference. But capping the tax benefits on second houses and property given out on rent will be quite discomforting,“ said Amit Maheshwari, managing partner of Ashok Maheshwary and Associates. The good news is that there is no change in the rules for long-term capital gains from equity and equity funds. It had been speculated that the Budget would extend the minimum holding period from one year to two-three years.